BAGHDAD, Iraq (CNN) -- Saddam Hussein could be hanged as early as Saturday, one of the former Iraqi dictator's lawyers told CNN on Friday. "Different sources" said the death sentence would be carried out Saturday morning, defense attorney Najib al-Nuaimi said from Doha, Qatar. "I think the Americans will accompany him onto the execution stage and I think they will have a pre-recorded film that will be released [Saturday] evening if they carry out the sentence in the day," he said. Although Mitch, who originally locked in January 2007, moved his pick a bit earlier, to tomorrow as well. Mark your dead pools for Saturday, 3PM Central time (midnight Baghdad). Here’s why; Ronald Reagan and the Pope both passed away moments after the NARN show let off the air. Now, you’d be right in saying that there’s no comparing Hussein with either of those two great men, or comparing the natural deaths of two men after long, rich lives to the execution of a genocidal Napoleon. That might well throw my prediction off. But I gotta start somewhere. Whenever it will be, it will be soon, and allow the Iraqi's to move on. Gerald R. Ford, who picked up the pieces of Richard Nixon's scandal-shattered White House as the 38th and only unelected president in America's history, has died, his wife, Betty, said Tuesday. He was 93. His presidency was at an awkward time, but he carried the country admirably. A small bit of trivia, he was the last surviving member of the Warren Commission tasked with the investigation of the John F Kennedy Assassination. Thank you, President Ford, for your service. May you rest in peace. Lights Please . . .
"And there were in the same country shepherds, abiding in the field, keeping watch over their flock by night. And, lo, the angel of the Lord came upon them, and the glory of the Lord shone round about them! And they were sore afraid ... And the angel said unto them, "Fear not! For, behold, I bring you tidings of great joy, which shall be to all my people. For unto you is born this day in the city of David a Saviour, which is Christ, the Lord." Whether you like hockey or not, can't you just feel the intensity. One of many on CNNSI's 'Most Interesting Pictures' of the year. In Greek mythology, the Lernaean Hydra was an ancient nameless serpent-like chthonic water beast that possessed numerous heads— the poets mention more heads than the vase-painters could paint— and poisonous breath (Hyginus, 30). The Hydra of Lerna was killed by Heracles as one of his Twelve Labours. Its lair was the lake of Lerna in the Argolid, though archaeology has borne out the myth that the sacred site was older even than the Mycenaean city of Argos, for Lerna was the site of the myth of the Danaids. Beneath the waters was an entrance to the Underworld, and the Hydra was its guardian (Kerenyi 1959, p. 143). WASHINGTON (CNN) -- Shiite Muslim cleric Muqtada al-Sadr's Mehdi Army has replaced al Qaeda in Iraq as "the most dangerous accelerant" of the sectarian violence plaguing Iraq for nearly a year, according to a Pentagon report. Attacks by Iraqi insurgents and sectarian militias jumped 22 percent from mid-August to mid-November, and Iraqi civilians suffered the bulk of casualties, according to the quarterly report released on Monday. The average number of attacks reported each week jumped during that period from nearly 800 to almost 1,000, the report said. I'm still waiting for someone to play the roll of Heracles. Over the weekend we heard of Evan Bayh's departure and Sen. Edwards' likely entrance in to the 2008 Presidential sweepstakes. I have started a new sidebar entry in an attempt to keep track of these contenders. Once a candidate forms an exploratory committee, or states publicly they plan to do so, they will be added to the list. Should they drop out, that will be noted, and they will remain on the list for a brief period of time before they are dropped. Electoral Vote has already formed a nice compilation of potential candidates, so be sure to stop by and review their take on this crucial race for our country's future. Well, not home in Minnesota, but on dry land in California where his home is. The Corporal will be hanging out through the holidays until his orders come through. The next stint is looking like a 13 month deploy as a member of the Iraqi' security contingent. Boots on the ground as they say. He is also talking about being a member of the 'Bomb Squad'. I am making a few changes with my career in the Marine Corps. I am making a move into the EOD field (explosive ordnance disposal). I'll be on the bomb squad! Yeah! Talk about a parental buzz kill. But for now he is safe and sound. I can't worry just yet about that which I can't control. As always, I'll keep ya posted. A suicide bomber targeting laborers killed 71 people Tuesday in Baghdad and wounded 220, Iraqi officials said. A pickup truck loaded with about 440 pounds of explosives pulled into central Baghdad's Tayaran Square as hundreds of unemployed Iraqis holding picks and shovels gathered seeking a day's work. The truck driver signaled that he had jobs -- prompting people to crowd around the pickup before he detonated his bomb, said an Iraqi Interior Ministry official. The "new" issue of the day I see is get some factories going over here to put people to work. I surmised years ago that when people are unemployed they sit around thinking how terrible their lives are and they are moved to acts of violence. It happens over and over in places like the Balkans, Iraq, and even in the US. Simply put: people that are employed don't have the time nor do they have the inclination to take up arms and fight. Seems like a no brainer to me, but we haven't put that into practice much. The Iraq news today seems to be one of finally "getting it" and one of re-trenchment. The "getting it" is that the powers that be have finally realized that when there's 70% unemployment, all those out of work people are a ready-made breeding ground of insurgents. So now we're finally going to concentrate on helping to rebuild the Iraqi economy so people can work. It never ceases to amaze me that they come to this "realization" when the facts of the issue have been identified throughout history. If the folks living in depressed areas of MN/USA had full employment, good education and a glimmer of hope for their future, would they participate in gangs, crime and drugs? Certainly not in the numbers they are now. Our society tosses these people under the bus then can't understand why they live the way they do. Amazing. Over here in Iraq we put all the former Government employees out of work, fired the soldiers and police, didn't create new jobs and wonder why they fight us. We will need to see a brief up tick in forces to restabilize and secure economic centers and work more diligently in getting the Iraqis back to work. As more and more of them feel success and see the potential future that is available to them, the recruitment ability of the terrors cells will be effected. Violence could very well subside, and the need for the larger security forces, specifically international one, may diminish. Damn few leaders were talking about true reconstruction as part of our "winning strategy". Despite many billions simply vanishing, it's taken all of our resources to start fixing Iraqi basic infrastructure that has crumbled under years of war and UN sanctions. The sad thing is that investors need security to start putting up factories...and security is almost impossible to find. Especially, as pointed out above, in the middle of a widening civil war. I fear, once again, we started too little, too late, and with the wrong priorities. I'm not convinced it is too late, and if the military planners start finally 'getting it' there is hope they can work towards rebuilding the economic infrastructure as well as the security infrastructure. But I will agree the clock is running out, and if there is going to be a chance at success in Iraq, things need to start happening pretty quickly. Things have been hectic both at work and home. I can't even blame the holidays. I am working on a post regarding Iraq, and why we have seen violence at job centers recently. Not only is the Iraqi and coalition forces recognizing the importance of a strong employment system, but the resurgents recognize how that will impact their recruitment ability. More on that as I cull through my material. The case of the self-described engineer and his fermenting corn is headed to the county attorney. "In my 18 years, I don't think I've ever even seen a still, except on the 'Beverly Hillbillies,' " said Maplewood Police Lt. Dave Kvam, who raided the apartment Friday. Police have more questions than answers because they haven't yet talked to the apartment dweller about the still and fermenting corn. He didn't appear to be home Monday. Kvam said he will forward the case to the Ramsey County attorney's office later this week for possible prosecution. In Minnesota, an unauthorized still is prima facie evidence of illegal alcohol production. Kvam said it's possible, though unlikely, that the man has a federal license to produce ethanol, which is essentially the same as moonshine. It also seems unlikely that such a license would be granted for operation in an apartment, he said. Say it Ain't So, Dennis! There was obviously going to be a peacnik candidate, but Kucinich, again. Isn't there someone, anyone else out there to represent the Left of Wellstone Democrats. The Dems have a chance to win the White House, I hope they are careful to not blow this chance by failing to realize what the electorate wants. The vast majority want a redeployment and change of course in Iraq. I don't think they want to evolve into a pacifist nation, though. Olympic bomber Eric Rudolph laments in a series of letters to a newspaper that the maximum-security federal prison where he is spending the rest of his life is designed to drive him insane. So is he expecting to be treated better than his victims. Seems to me he already is, so as Ann Landers would say " Quit yer Beefin' "
One of the main premises behind these Super Maxs is to isolate these notorious killers and have them wallow in solitude. I am a little concerned that the Gazette would give him any print at all, and embarrassed for myself for even bringing it up. Oh well. Last word from me on Rudolph. What a whiner! Living in the frozen Tundra of Minnesota, we know cold well. But for those of us following the events in the Pacific Northwest over the last few days, we have a new perspective. While his wife and kids were rescued a couple days ago, James Kim was not so lucky (watch the CNET tribute). Feeling the reality of their seclusion, Kim felt the need to venture out, and seek help. Many of us 'dads' probably would have done the same thing, considering the patience already displayed by the family. However, sometimes the survival instinct still rooted in our primordial minds overrules the actions an arm chair quarterback, with hindsight, might have taken. If you have to make a choice between food, water and shelter from the cold, then shelter wins out in a big way. You can read the almost 3000 'thoughts and condolences' to the Kim family here, and leave your own if you choose. McCain Picking a Dirty Fight? According to a source close to the McCain operation, the candidate has lined up Terry Nelson to serve as campaign manager (if a formal bid is announced), and Republican National Committee Communications Director Brian Jones has committed to lead the press effort for a national bid. Nelson, along with Karl Rove protegé Scott Howell, produced a controversial ad in Tennessee's 2006 U.S. Senate race between Democrat Harold Ford, Jr. and Republican Bob Corker in which a white woman seductively invites an "off-camera" Ford to call her. He was supervisor over James Tobin, the convicted New Hampshire GOP operative who schemed to jam Democratic phone lines in the 2002 election season. McCain could loose me if this is how he starts his campaign. Going negative out of the box is a sign, to me, that even the candidate feels they couldn't win on their own merits. I struggle to find a scenario where I could support a Hillary Candidacy, if nominated, but the Republican's are obviously set on creating just the right set of circumstances. The electorate is moderating, and many of us are a bit fed up with the dirty pool in politics. Isn't it a bit early to disenfranchise us? As expected, McCain struggles with conservatives. Among conservative voters, the Arizona Senator is essentially even with Gingrich, far behind Giuliani. While there has been no change in the McCain-Clinton match-up, Rudy Giuliani (R) has opened a five-point lead over Clinton, 48% to 43%. In the previous survey these New York politicos were tied at 46%. So my Right Wing readers, could you plug your nose and vote for one of these RINOs, or do you have something else up your sleeve to attract a more conservative candidate, giving the Dems a better shoot at returning to the White House. What a dilemma you are in. Stick to your values and lose, or compromise them and have a shot. "It's clear the Iraqi government will need U.S. assistance for some time to come, especially in carrying out new security responsibilities. Yet the U.S. must not make open-ended commitments to keep large numbers of troops deployed in Iraq." -- encourages the administration to explore fresh diplomatic options to solve the Israel-Palestinian conflict. -- recommends direct talks between the United States and Iran, as well as Syria. The President has been chilly to this idea. -- "Iraq's neighbors and key states in and outside the region should form a support group" to help Iraq achieve long-term security and political reconciliation -- "neither of which it can sustain on its own,"
"What we recommend demands a tremendous amount of political will and cooperation between the executive and legislative branches of the U.S. government," the report says. "Success depends on unity of the American people at a time of political polarization." The report concludes: "Foreign policy is doomed to failure -- as is any action in Iraq -- if not supported by broad, sustained consensus." There are other reports out there, and I am sure the polipundits will cherry pick what they want to believe out of the report that supports their predetermined conclusions. But the bipartisan ISG, co-chaired by former Secretary of State James Baker and former Democratic Rep. Lee Hamilton, just may have the most credibility. A PDF of the report will be available at their website during this morning's 10:00 AM CST Press conference. Some reading material for my lunch break. In what is described as a "random act of bipartisan kindness," incoming Democratic House Speaker Nancy Pelosi has reportedly offered her Republican predecessor Dennis Hastert prized office space during the 110th Congress, according to a report in today's Roll Call. The article in the "Heard on the Hill" gossip column by Mary Ann Akers suggests that Pelosi will not house the controversial former Speaker of the House in a less desirable space. While he loses the office with a balcony he has occupied, Hastert will take over the coveted office of the outgoing Republican chairman of the Ways and Means Committee, who is retiring at the end of the 109th Congress. The office provides a favored view of the National Mall. Roll Call also presents the possibility that the move could result in some controversy among House Democrats. WASHINGTON (AP) -- Unable to win Senate confirmation, U.N. Ambassador John Bolton will step down when his temporary appointment expires within weeks, the White House said Monday. Bolton's nomination has languished in the Senate Foreign Relations Committee for more than a year, blocked by Democrats and several Republicans. Sen. Lincoln Chafee, a moderate Republican who lost in the midterm elections November 7 that swept Democrats to power in both houses of Congress, was adamantly opposed to Bolton. Critics have questioned Bolton's brusque style and whether he could be an effective public servant who could help bring reform to the U.N.
My favorite in a bunch of on topic 'toons at Cagle. Even our own Strib drawer was in the mix. Commenter Steve who was in country had some more analysis on the Doctor's Iraq post. Actually serving over here in Iraq I can tell you that much of what was written by the doctor is true. We could go on for hours about how we win wars only to lose the peace, and why that happens time and again. We keep electing incumbents and the even the same "types" of people over and over yet we expect different outcomes. Having been "in country" for almost a year now, and working alongside Iraqis, I can tell you that we can not even begin to understand the people of the Middle East. Our experience of Democracy is not what they can or will ever understand. We have to shift our thoughts and see things through their prism. and some agreement with disbanding the Army int he early days. We committed a grave error by invading in the first place, by disbanding the Iraqi security forces (Army and Police), and by tossing out all the government officials who knew how to make things work. And of course we didn’t have any clue about how to win the peace. This was supposed to be a “revolution” that sprang up from our ground assault. Revolutions only work when they come from the grass roots, not from an outside source. Outside armies like the French came in after we had already won our Revolutionary War. After the way we acted in Gulf War I (with Prez Bush I) who could blame the Iraqis for not trusting us to help them toss out Saddam? Thousands died believing America’s assurance of support in 1991. Fool me once, shame on you, fool me twice, shame on me. You may have read the post, but be sure to read the comment thread as well. 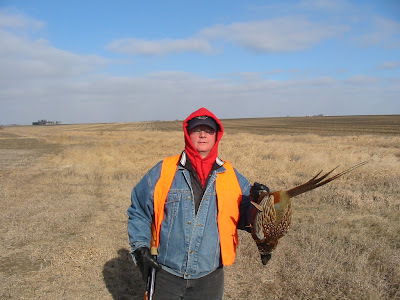 The Doctor and I went back to Iowa for another round of pheasant stalking. Saw more deer than birds on Saturday, which doesn't mean we didn't see many birds. Just that we saw a lot of Deer. I didn't even fire my gun on Saturday. Clive was successful later in the afternoon and dropped his first bird of the season. Sunday was a bit colder, but we were determined. Than it happened in a flurry with a flush. I lowered my gun and beaded on the nice size rooster. BAM! One shot and it dropped like a rock. Below is a pic with the fantastic habitat we hunted in the background. That was probably my last trip of the year. Doc will be down for family events over the holidays, so he gets one more shot at 'em.